For parents all over the world, choosing a baby’s name is one of the most complex decisions to make before or after a birth. That choice is often more complicated for immigrant parents and parents of color in the United States, who face long-term threats a traditional, non-Anglo name can bring to their children’s lives. There is proof that non-Anglo names on resumes get overlooked in the hiring process, while teachers often bypass efforts to pronounce foreign names correctly. Both are real-life consequences of a society that privileges a Katie over a Ximena. The answer is simple. A name is a way for immigrant parents to celebrate their cultures and pass on traditions to their children, even when living outside of their home country. And people who’ve experienced the trauma of a butchered name have been speaking up in the last few years. Actress Uzo Aduba narrated how her mother encouraged her to embrace her name in a talk on International Day of the Girl in 2017, saying, “If they can learn how to pronounce Tchaikovsky, they can learn how to say Uzoamaka.” The poet Warsan Shire wrote about the importance of giving daughters complex names in one of her poems, saying, “Give your daughters difficult names. Give your daughters names that command the full use of the tongue. My name makes you want to tell me the truth. My name doesn’t allow me to trust anyone that cannot pronounce it right.” More recently, Congresswoman-elect Alexandria Ocasio-Cortez surprised the political landscape by choosing to adhere to her two last names, a common practice in Latin America. 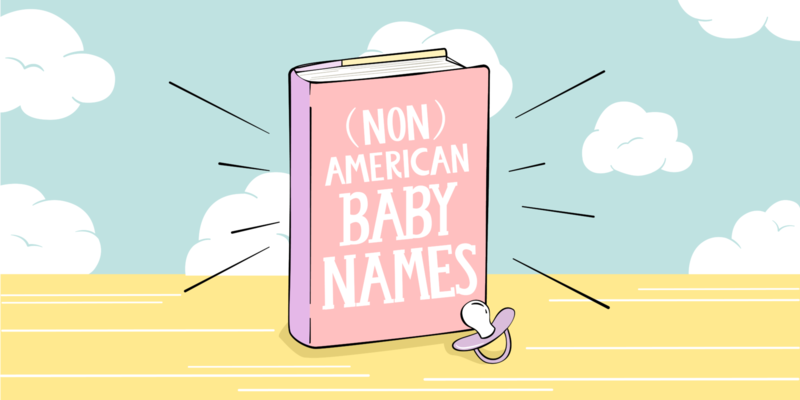 Still, some parents feel immense anxiety and uncertainty when choosing a non-Anglo name (the Dear Abby column is proof). With this in mind, we asked five parents to tell us why they decided to keep cultural tradition alive through their children’s names. I have two daughters. Jiya is 2 years old and Azaadi is 5 months old. Both my wife and I come from Punjabi Sikh families, and we both have traditional Punjabi Sikh names. We wanted to continue this tradition, both to honor those who came before us and to give our daughters a connection to their beautiful heritage. We didn’t have any doubts at all about selecting traditional names for our daughters. In fact, we never even had a discussion about it—my wife and I had an unspoken assumption that this would be the case. To be honest, we did discuss the issue of how names would be pronounced by people who are not native Punjabi speakers and the potential impact of those mispronunciations. That led us to eliminate a few names, unfortunately, but nevertheless: that concern didn’t drive our decision. We don’t regret our decision. These are beautiful names that reflect core values and the histories of our communities. These names might come with small challenges of mispronunciation, but that’s a small price to pay in comparison to the weight that these names carry. For us, this was a way for us to remain connected with a tradition that is deeply important to our families. It’s also an act of resistance that indicates our unwillingness to bow to white supremacist expectations that we must give up our cultures and assimilate into a particular idea of America. My kids’ names are Maia, 14, and Carlos, 12. I chose a cultural name for my daughter because it was important for me that the name be easy to pronounce in English and Spanish for my Puerto Rican relatives and, in my daughter’s case, I chose her middle name, Mercedes, after my abuela, Mercedes Díaz. I wanted both my children to have a connection to their past. My son is named after his paternal grandfather, Charles Martin, hence Carlos Martín. I wanted to give him a very specific Spanish name because this child is half Puerto Rican and my culture matters to me. I never had doubts, but my husband did. I think he wanted to give them Anglo-sounding names, but my Puerto Rican parents did that to me and I didn’t want to do that to my children. Discrimination exists, so I may have hampered my son’s chances for being employed in the future, but I may have helped him as well. I want my children to be proud of their heritage (and to use that pride when communicating their value as a job candidate to potential employers). I also like my children’s names. I met my husband’s grandfather and adored him; it’s a nice homage to him and to my culture. These names were a personal choice, but I love cultural family names in general. We live in a country with people from all over the world. Why not reflect that in the names we choose for our children? Hearing names that exist outside of someone’s cultural window helps that person to understand that people live outside of her or his experience, too. I have a 4-year-old daughter. I chose her name, Valentina, because my husband and I are Hispanic. We are proud to continue carrying our heritage, even if our daughter was born here in the United States. Valentina is a name derived from ancient Latin and Aranza comes from Basque origin. I never had any conflicts about the name, even when I knew the pronunciation would vary in English. I always try to emphasize the Spanish pronunciation of Valentina. She’s young, and I find that English speakers don’t pay too much attention to the way they pronounce her name if I don’t make the effort. I don’t regret our decision at all. Our daughter was born here and we are proud that, even as a toddler, she is bilingual. At home, we only practice Spanish. At school, she speaks English. And she is very proud of her Hispanic background. I think the value in cultural names is to recognize where you come from and take pride in your heritage. Also, continue teaching our kids our culture, which is critical for identity-building and their future. If someone argues, I would just ask them to not bother in wasting time trying to convince me to change my mind. I’m proud of where I come from and I will definitely continue to preserve our culture with our children. They are our future. These are beautiful names that reflect core values and the histories of our communities. I have two kids, Natalia Zoe and Joaquin Valentino. I chose their names based on what I felt were lovely sounding and also meaningful to their father and me. These names aren’t traditional Mexican names but they aren’t American names either; they reflect our lives together, even if we’re divorced now, and the love we have for our children. My daughter has had issues with some of her teacher’s mistaking her first name as Natalie instead of Natalia. She will sometimes not correct them but I try to instill in her a love for her name and a willingness to tell others when they pronounce it incorrectly. Joaquin has had a bit of a harder time because people often try to pronounce it with a hard J instead of as an almost silent H sound. He does get upset when teachers say his name wrong. I believe people mispronouncing cultural names to an Anglo counterpart has much to do with laziness and taking the easy route: sticking to what they know instead of expanding their worldview. I do regret not adding their respective accents to their names, which are supposed to be Zoé and Joaquín, as I feared they would struggle in their future with paperwork or legal documents. It’s important to remember where we came from, to remember our roots. As a first born child of immigrants, I know the struggles my parents faced living here. But they gave me a unique and beautiful name, and I wanted the same for my children. It’s okay to name your children whatever the latest fad is or your favorite fruit is but I believe having names that reflect a tradition and a history is important as well. We need to hold a lens to our past and and use what we learn to grow into a better, more inclusive future. I am an American woman married to an Indian man. We chose to give our daughters Indian names because we wanted to cherish my husband’s heritage. We also wanted our daughters to grow connected to their roots and understand that, even when they are far from India, they can still be proud of their father’s culture. They are both very young so they haven’t had any issues with their names so far, but we make a big deal of them learning their correct pronunciations and not the anglicized version. We want them to be able to defend themselves in future instances. It’s crazy that we have to think about that, but we want them to have the courage to stand up for their heritage. I was actually the one who brought up giving them traditional Indian because I wanted to honor their father’s family (they are all in India). Their dad was very happy with the idea and we searched for the right names for each of them. One means “endless” and the other means “liberated.” I think people in the United States should really open to the idea that names are a way to celebrate culture and this country is not a monolith. So many identities live within the same nation—we should take the time and openness necessary to appreciate other cultures’ names as they are and not try to anglicize them.